Beans vs. Cornbread » The Haul – They don’t get no respect! The Haul – They don’t get no respect! Hung out with good friends this Saturday as a break from working on the book. We watched the 80’s video DVD that I bought (that one deserves it’s own post) then the “Masters of the Universe: best of seasons 1 and 2′ or whatever it’s called (and THAT deserves it’s own post). There was much laughter and moments of being disturbed from both. All in all, a great day, IMHO. Seeing as how Saturday is the only day of the week that I even leave the house for reasons other than work, We hit some of the usual places and I got some of the usual things. 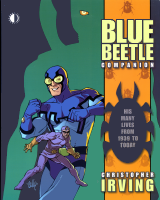 Blue Beetle Companion by Christopher Irving – Hipped to this book by a great Newsarama.com article, I had my local comic book shop order this for me 2 weeks ago. I’m not even at the quarter way point (too busy workin’ on the site update) but I’m already in love with the book. As mentioned in the Newsarama feature, the hook isn’t just that it’s about Blue Beetle but how the people involved in creating him turn out to be many people that form the backbone of comic history itself. Will Eisner, Joe Simon, Jack Kirby, Robert Kanigher and just more, ‘What, him too?’ reactions than you can shake a stick at. A great book about a character who seems to have it all (even a radio show!) except for one thing: respect. If you see it at your local comic shop, give it a chance. Trust me, it deserves it. Christopher Irving definitely cooked up a great book here. Knights Kingdom II: Rogue Knight Battle On the way back home, we stopped at K-Mart. Hoping to find some discounted Batdragster sets for spare parts, found an even better bargain of this set at $8. I found the latest round ro KK2 to be bland compared to the ill Scorpion logo enemies of the earlier sets, but this is some nice parts fodder. If they still have them, I may get another one (or two?) next week. Rodney Dangerfield: I Don’t Get No Respect! Since I was going to check out at the less-crowded electronics desk, I browsed the DVDs in disappointment. On the way out of that isle, I catch the cover of the comedy CD and the price of $3. Well, I couldn’t pass that up. Haven’t heard that yet either (again with the site work) but I know I’ll be cracking up. I’m pretty sure I’ll be one of the only people on Earth with a comedy CD selection that has both Rodney Dangerfield and Robin Harris. Thanks for the love on the Blue Beetle Companion! I hope you enjoyed the rest of it. Hey, the book got it’s love the old-fashioned way… it earned it! Besides seeing this character walk (or fall through) so much comic history, I’m shocked that he’s had so many tribute characters and revamp ideas based on him. The book is definitely a great read and I’ll post about the whole thing in a later post. Thanks for responding and good luck on that series of books that you’re cookin’ up now!